A slender fast-moving snake with smooth scales, a large head and eyes, and a thin neck. Large scales above eyes. 17 scale rows at mid body. Coloration is variable, with a light, silvery phase, and a dark phase. Only the dark phase has been found in California. The dark phase is a dark grayish-brown overall, with narrow, light lines on the sides. There is no contrasting dark head or dark neck bars. The braided appearance of scales on the tail (like a whip) gives this snake its common name. Active in the daytime. Hunts crawling with the head held high above the ground, occasionally moving it from side to side. The prey is overcome and crushed with the jaws or beneath loops of the body and eaten without constriction. Often strikes agressively when threatened or handled. Good climbers, able to climb bushes and trees. Seen moving quickly even on hot sunny days, but often seen basking on roads in early morning or resting underneath boards or other surface objects. Frequently run over by vehicles and found dead on the road, partly due to the tendency of this snake to stop and eat road-killed small animals. Eats small mammals including bats, nestling and adult birds, bird eggs, lizards, snakes, amphibians, and carrion. Hatchlings and juveniles will eat large invertebrates. Lays eggs in early summer which hatch in early Fall. Occurs in California only in a small area of southern San Diego County near the Baja California border. Occurs throughout Baja California. Inhabits open areas of grassland and coastal sage scrub. Taxonomic Notes North American snakes formerly placed in the genus Masticophis have been changed to the genus Coluber based on a 2004 paper * by Nagy et al. Utiger et al. (2005, Russian Journal of Herpetology 12:39-60) supported Nagy et al. and synonymized Masticophis with Coluber. This has not been universally accepted. 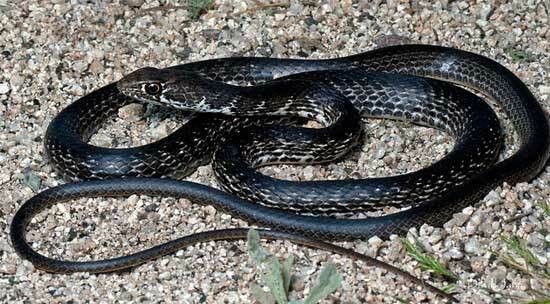 The most recent SSAR list has hinted that the genus Masticophis might be re-instated: "Burbrink (pers. comm.) has data to reject Nagy et al.’s hypothesis but we await publication of these data before reconsidering the status of Masticophis." Grismer recognized C. fuliginosus as a distinct species in 2002. The snake is still recognized as a subspecies of Coluber flagellum, C. f. fuliginosus, by some authorities who then recognize six subspecies of Coluber flagellum, including C. f. fuliginosus, and two other California subspecies - the San Joaquin Coachwhip - C. f. ruddocki, and the Red Racer - C. f. piceus.